Update, Feb. 11, 1:10 p.m.: According to the Huntington Arts Council, the opening reception scheduled for Feb. 5, originally postponed due to snow conditions, has been moved to Friday, Feb. 19, from 6 to 8 p.m. at the Main Street Gallery. The Huntington Arts Council’s Main Street Gallery will present its latest exhibit titled “Earth, Air and Water: A Celebration of Tri-State Wildlife and Nature” from Feb. 5 to 27. An opening reception will be held on Feb. 5 from 6 to 8 p.m. All are welcome to attend. Participating artists in the juried photography show include Talia Amorosano, Irene Andreadis, Debra Baer, Amy Bisagni, Holly Black, Winifred Boyd, Laura Rittenhouse Burke, Terry Canavan, Dorothy M. Chanin, Tom Colligan, Joseph Cutolo, Leonard Digiovanna, Jessie Edelstein, Monica Friedrich, Jay Gammill, Shannon Gannon, Susan Geffken Burton, Phyllis Goodfriend, George Gough, Jovanna Hopkins, Patrick Keeffe, John Killelea, Susan Kozodoy Silkowitz, Julia Lang-Shapiro, Mark Lefkin, Matthew Levine, Elizabeth Milward, Vera Mingovits, Trish Minogue Collins, Howard Pohl, Tom Reichert, Burt Reminick, Spencer Ross, Max Schauder, Harry Schuessler, Ruth Siegel, Don Thiergard, E. Beth Thomas, Susan Tiffen, Mac Titmus, Pamela Waldroup and Joan Weiss. The exhibit was judged by Andrew Darlow, a New Jersey-based photographer and digital imaging consultant whose photography has been exhibited internationally and has been featured in numerous magazines and websites. He has lectured and conducted seminars and workshops around the world. Of the 154 pieces of work submitted, Darlow chose 42 photographs to appear in the show. “Photography is like magic. In a fraction of a second, a moment can be captured that will never be repeated exactly the same way again. This is especially true when our images include wildlife and nature,” said Darlow. “The entries for this show truly showcased the natural beauty and splendor of New York, New Jersey and Connecticut. In addition to many spectacular images of animals, flowers and breathtaking water scenes, I selected some photographs that include people and man-made structures. This balance between the human and natural worlds fascinates me, and I really look forward to viewing the exhibition on the gallery walls,” he added. Best in show went to “Crab Meadow Sunset” by Irene Andreadis, and honorable mentions were “Osprey in the Rain” by Tom Reichert and “Cutchogue Barn” by George Gough. Congratulations! The Huntington Arts Council’s Main Street Gallery is located at 213 Main Street in Huntington. It is open Monday to Friday from 9 a.m. to 5 p.m. and Saturday from noon to 4 p.m. For more information, call 631-271-8423 or visit www.huntingtonarts.org. December’s wacky weather made life more difficult for everyone — but sea turtles at West Meadow Beach had a particular struggle. Recent outdoor temperatures were largely above normal, with some brief moments of frigid cold. Molly Hastings, who serves as Brookhaven’s environmental educator and park ranger, saw some of the environmental consequences of this when she received an unusual knock on her door on Dec. 20 after a volunteer encountered two immobile, or cold-stunned, sea turtles. Hastings said the knock came from Celeste Gorman, who was taking a hike along West Meadow Beach as a volunteer in search of turtles rendered immobile by the cold weather. She ended up finding two in a very short span of time. The National Oceanic and Atmospheric Administration described sea turtles as cold-blooded animals with circulatory systems that can slow to the point of immobility when exposed to extremely cold temperatures. Various factors have helped contribute to the higher prevalence of cold-stunning, like more shallow bodies of water and more dramatic temperature changes, NOAA said. Hastings said she was well aware of the impact an unpredictable climate has on the wildlife living not only at West Meadow, but across the town and country. She said this small, isolated incident with the sea turtles should serve a greater purpose. Proceeds raised at a bowling event on Sunday will be used to feed and care for the more than 100 animals that live at Brookhaven Town’s Holtsville Wildlife and Ecology center. Halloween Bowl for Animals will run from 4 to 7 p.m. at Bowl Long Island at Patchogue, and will cost $30 for adults, $20 for children and $10 for non-bowlers who attend. That price includes unlimited bowling, shoe rental, a buffet and dessert. Reservations are required. “This is a great event for the entire family that will help to ensure the animals at the ecology site continue receiving the proper care,” Highway Superintendent Dan Losquadro said in a statement. The spooky bowling fundraiser will include a costume contest — children are encouraged to dress as their favorite animal — and a 50/50 raffle. To reserve lanes, register online at www.brookhavenwildlifecenter.org or call 631-758-9664 x11. The bowling alley is located at 138 West Ave., Patchogue. Like many sons, Jay Gammill has followed in his father’s footsteps, a U.S. Navy photographer during World War II. “My father had a tremendous amount of photographic experience. We even set up our own darkroom for processing pictures in our basement. Dad was always the guy with the camera,” said Gammill. Jay Gammill photographs local birds. Born and raised in Long Island City, Queens, Gammill spent his entire life on Long Island, with the exception of his four years in the U.S. Air Force, 1968-1972. He met his wife Janet after returning home from the service. They married in 1976 and moved into their first home in Levittown. In 1999, they moved to their current home in East Setauket. Gammill received his first camera, a Brownie Starflash, as a young boy. “Boy, was I happy! No one could turn around without a flashbulb going off in their face,” he said. And so began a lifelong passion. When Gammill entered high school at Rice High School in upper Manhattan, he was in the yearbook photography club, and his parents bought him his first 35mm camera. “That camera was glued to me; if there was any kind of school activity, you could be sure I was taking pictures. It was very gratifying to have many of my pictures published in my senior yearbook,” he said. Retiring as the director of the maintenance training department of New York City Transit in 2009 gave him more time to pursue this unique hobby. Gammill has some advice for anyone interested in photography. “Taking photographs will expand your horizons. It is a very enjoyable hobby, getting you out of the house into the fresh air, not to mention some exercise, which I recommend to anyone.” For himself, he has lots of plans. “Now I want to increase my efforts into landscapes, sunsets, night photography and other areas,” he said. Mimi Hodges, a resident of Sound Beach and long-time friend of Janet Gammill and her family, credits Jay Gammill with revitalizing her own enthusiasm for photography. At a family get-together last year, Gammill invited Hodges to join a closed Facebook photography group. “The result is that, for the past year, my interest in photography has been revived and I am truly enjoying this renewed passion. I owe it all to Jay,” said Hodges. Gammill has posted some of his own photographs on Facebook and was surprised that so many people enjoyed them. When asked by friends how he finds these birds, Gammill answers, “They are all around; you just have to look.” And when Gammill looks through his camera, what he sees is spectacular! Belle Terre residents are up in arms, or ready to take up arms, over a village government proposal to allow bow hunting as a means of reducing the community’s deer population. The village board of trustees set a public hearing for Sept. 15 to consider a law amendment that would allow the hunting, a notion that has split the community, with some calling for more “humane” approaches to the issue. But calling bow hunting “a very cruel way to kill,” resident Natalie Brett said she worried an injured deer would wander into her yard and die. She said she wants to see a more “humane” approach to the deer, using sterilization to prevent breeding, tick control to prevent Lyme disease, or stop signs to slow down traffic in deer crossing areas. But her main concern is whether allowing bow hunting will “open the door” to other types of hunting in a residential area. Sandak said any Belle Terre bow hunting would be subject to the same state regulations as in any other community. Among those regulations are minimum distances from homes where hunting can take place, ruling out smaller properties. Sandak estimated a property would have to be three acres or more to legally support bow hunting. 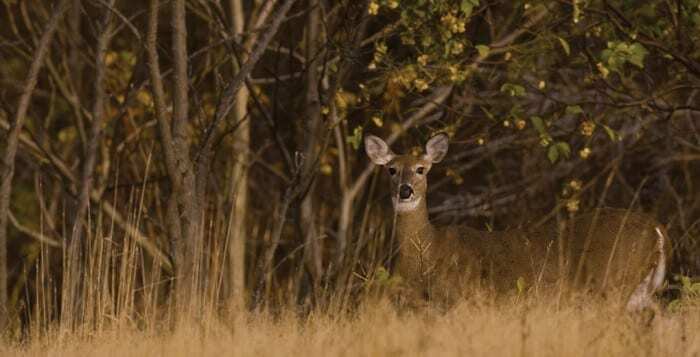 The DEC said fertility control is not as effective as hunting in managing deer populations and does not “quickly reduce deer-human conflicts.” And Sandak said he would not necessarily count sterilization as a more humane method, as it puts deer under “unnatural stress” and could leave the animal open to infection. It is also costly to pay for anesthetic and a marksman to hit the deer, and “doesn’t reduce the size of the herd because you’re not taking any of the herd away, as hunting would do,” the village trustee said. Dori Scofield, founder of Save-A-Pet Animal Rescue and Adoption Center in Port Jefferson Station, confirmed that sterilization is a costly and tricky method that unnaturally stresses out the deer, but she also said she has at least six veterinarians who would donate time to sterilize deer, and the village is small enough to monitor such a program. Scofield, a Stony Brook resident, also said in an email that having fewer deer would not reduce Lyme disease cases, as other animals like mice and raccoons also carry ticks. Furthermore, killing deer would not necessarily reduce that population, because it would leave more food for deer from neighboring areas to move in and motivate them to procreate. Belle Terre is not the only area considering deer hunting as a means to control the population. The Town of Huntington is mulling a similar proposal for parts of Eaton’s Neck and Asharoken, and residents there are equally split. Scofield said people who move to a wooded area should expect wildlife. Sandak said he is leaning toward allowing bow hunting in the village because “I don’t have strong feelings against it” and he wants to vote for what the majority of the community wants. The Sept. 15 public hearing on the amendment to Belle Terre’s code chapter on hunting and firearms starts at 8 p.m. in the Belle Terre Community Center on Cliff Road. “I would like everyone to come to the public meeting and express themselves,” Sandak said. A bird has got new wind beneath its wings, thanks to rescue efforts by the Suffolk County Police Department’s Marine Bureau, whose officers freed the creature on Sunday after it became entangled on an offshore fuel platform in Northport. Officers Charles Marchiselli and Michael O’Leary were aboard Marine Bravo when they observed the bird tangled in string along the railing of the platform, about two miles north of National Grid’s Northport power plant, at approximately 11:15 a.m. O’Leary distracted the bird with a wildlife pole while Marchiselli covered it with a blanket and cut the entangling lines. The bird appeared uninjured and swam away after being freed, police said. The officers saw the bird while they were conducting a homeland security check of the platform, which is used to offload fuel for the power plant. National Grid owns and operates the plant, and sells its produced energy to utility PSEG Long Island, which distributes the power to Long Island residents. Dozens of residents weighed in at a public hearing on Tuesday on a Huntington Town Board plan that would allow seasonal longbow hunting of deer on Eaton’s Neck. The proposal would amend the town code to allow longbow hunting during hunting season on private properties on Eaton’s Neck and in unincorporated areas of Asharoken to anyone who has a hunting license issued by the New York State Department of Environmental Conservation. Nearly 30 people took to the podium at town hall to voice their concerns on the plan. Those who supported the proposal, which would only apply to private properties, said they wanted the measure in place to regulate what’s become an overpopulation of deer in the neighborhood. The great numbers of deer have given rise to public health, safety and quality of life issues, supporters said. Opponents called the plan an “inhumane” solution and suggested the town explores other deer management routes and raised questions about whether the hunting method would even be effective in curbing the population. Among the residents who spoke against longbow hunting included some who have been impacted by tick-borne illnesses, like Lyme disease, an infectious bacterial disease that if left untreated can spread to the joints, heart and nervous system; and babesiosis, a disease caused by microscopic parasites that infect red blood cells. He said in research he’s carried out on cases at other area hospitals, it seems as though medical centers on the North Shore are experiencing greater numbers of cases of babesiosis. “I’m thinking there’s a higher percent of ticks here on the North Shore actually have the disease than on the South Shore,” he said. Doug Whitcomb told Town Board members that the population has exploded to the point where “everybody encounters deer on a daily basis.” He and others pleaded with board members to consider the elevated health risks associated with a large deer population and to allow longbow hunting. “I am here to represent that the residents of Eaton’s Neck deserve the same opportunity to quality of life as all of the other residents of Huntington have, and deer are causing us unimaginable problems,” Whitcomb said. Animal advocates, however, took aim at longbow hunting. The uptick in the deer population has led to a rise in car accidents, residents said. They also claim the animals eat their plants. Residents of the Eaton Harbors Corporation have been working on the issue. The group posted on its website a January meeting with DEC deer biologist Josh Stiller, who provided an overview of the deer population growth issue. In prior interviews, Councilwoman Susan Berland (D) and Councilman Gene Cook (I) spoke about wanting to see a more humane approach to managing the deer population. In separate interviews after the public hearing, they said they hadn’t decided whether they’d support the measure or not. Councilman Mark Cuthbertson (D) echoed similar sentiments. Supervisor Frank Petrone (D) told reporters that he felt something needed to be done and that he’d look into the issue further. “It is getting out of hand. We have to do something. Are we happy about this alternative with bows and deer running and they’re shot? No. There’s no immediate quick fix,” the supervisor said.